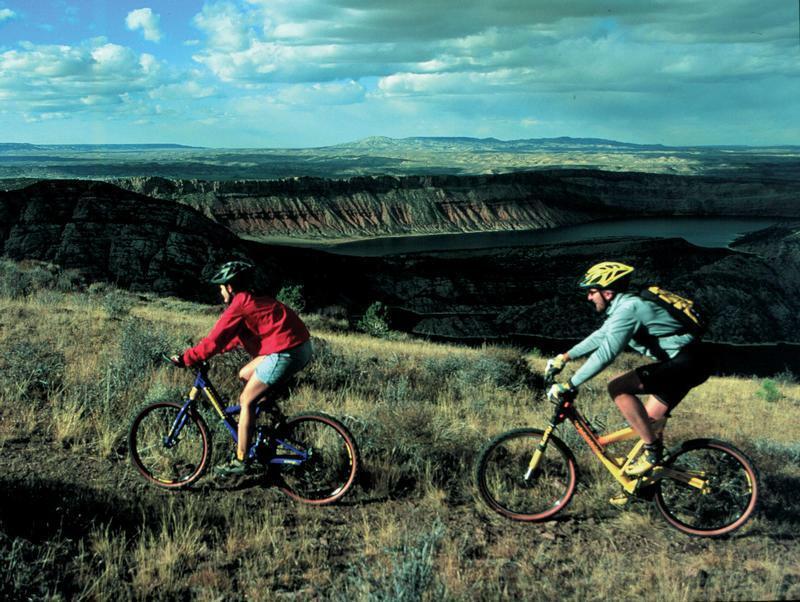 John F. Kennedy once said, “Nothing compares to the simple pleasure of riding a bike.” Mountain biking the landscape surrounding Flaming Gorge is no exception. For decades, boaters, anglers, and outdoor lovers have all been enjoying the deep and colorful canyons of Flaming Gorge, but more recently the trails along its rim and in the surrounding mountain hills have grabbed the attention of fat tire enthusiasts. Here are three fantastic rides to get you started. 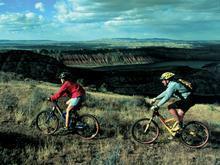 Everyone mountain biker who travels to Flaming Gorge should experience The Canyon Rim Trail. This beginner/intermediate 9.5-mile out and back ride, with minimal vertical gain, is the perfect introduction to area, and it has the added bonus of jaw-dropping vistas. The trail begins at the Red Canyon Visitor Center, located three miles down the turnoff between mileposts 3 and 4 on UT 44. The trail heads east following the edge of the canyon offering numerous views of the crimson walls of Red Canyon above the cobalt water of the reservoir 1,400 feet below. This short and scenic ride is perfect for most abilities and ideal for families as you can turn around at any point. Some rocky section may not be great for the youngest riders, but these sections are short and are easy to push the bike through. Advanced cyclists with plenty of stamina and bike-handling skills can opt for the 20-mile Elk Park Trail, which features more than 2,000 feet of climbing. This loop ride follows a combination of double and singletrack trails found in the forested foothills of the Uinta Mountains. This outing will have you cruising through meadows, rolling by trout streams and treating you to views of alpine summits. Parking is located at the Deep Creek Road on UT 44 south of Manila at mile post 11.5. Head east and follow the double track for 1.5 miles to the beginning of the Elk Park loop. Riding the loop counter-clockwise, you begin by staying right and following the forest service road. Continue beyond the Deep Creek Campground and connect to the Spirit Lake Road. Once you reach the Spirit Lake Road stay left (west) paralleling Forest Service Road 221 for 1 mile before the trail turns south, heading to the Ute Mountain Fire Lookout Tower. South from the tower the trail turns to singletrack and leads to Browne Lake. From Browne Lake continue south through the Icy Hill Dugway before veering east toward Young Spring Park on the Old Cart Trail or Forest Service Trail 16 (FS16). Around this point the trail becomes rough and rocky for about 1.5 miles before hitting the South Elk Park Trail FS13. Head east on this mix of single and double-track to return to the beginning of the Elks Park Loop and the Deep Creek Road. Head right, east, back to your car. The Dowd Mountain Trail may just be one of Flaming Gorge’s best-kept secrets. This 10-mile loop is a combination of single- and double-track that winds its way through towering ponderosas and lodgepole pines. It’s lined with wildflowers, sage, and grass. The apex of the trail is the Dowd Mountain Overlook, where the earth falls away 1,700 feet to the deep blue water of the reservoir below. The climb to the overlook is very moderate and the descent is a rolling good time that will have you chasing elk and deer on your way back to the car. The ride begins 14 miles south of Manila just off Highway 44 on the Dowd Mountain Road. Parking is found just before the cattle guard. Traveling in a counterclockwise direction, the ride begins to the right of the cattle guard on singletrack cut from sage and rabbitbrush. From there you merge to wandering Jeep roads that will take you beneath an open forest of ponderosa pines with reflective blue diamonds marking the way. At the halfway point of the ride, you’ll arrive to the Dowd Mountain Overlook. Take in the vista and check out the information boards for trivia about the surrounding view. After you’ve had a chance to soak it all in, it’s time to get ready for the second half, which is way more fun than the first. The narrow singletrack descending from the overlook is fast and rolling. Back to a Jeep road for a moment you can open it up before turning right onto more singletrack that leads into a sheltered drainage filled with berms and rollers that make for fun and fast riding before depositing you back to your car. With 1,000 feet of climbing in 10 miles, it is well within most cyclists' abilities. The singletrack section west of the overlook may inch toward the intermediate ability level, but it can easily be walked. If there is any doubt, you may follow the main Dowd Mountain dirt road from the overlook back to the car. Trail maps for any of these sweet adventures may be downloaded from www.flamingorgegcountry.com. Thank you for visiting http://www.flaminggorgecountry.com/mountain-bike-trails! Be sure and revisit flaminggorgecountry.com frequently for content updates and more.